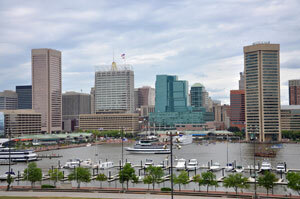 Baltimore, also known as Charm City, is the largest city in Maryland and is home to over 600,000 people. It has been ranked the 4th best cities for young professionals and is home to Johns Hopkins University, making for plenty of billboard and advertising opportunities. To target your college audience, there are competitive billboard rates near the campus of Johns Hopkins. The small transition into the corporate world in Baltimore for young professionals makes your advertisements relevant even once they leave college. There is also an internationally recognized performing arts culture in Baltimore especially with the Baltimore Symphony Orchestra. Possible options for advertising in this audience are digital signage near the venues where they perform. Additionally, there are several major highways that service Baltimore. Interstate 70, The Jones Falls Expressway, and the John F. Kennedy Memorial Highway are just a few of the billboard possibilities where you can get high traffic exposure of your business. Zip Codes: 21201, 21202, 21203, 21205, 21206, 21209, 21210, 21211, 21212, 21213, 21214, 21215, 21216, 21217, 21218, 21223, 21224, 21229, 21230, 21231, 21233, 21235, 21239, 21240, 21241, 21250, 21251, 21252, 21260, 21263, 21264, 21265, 21268, 21270, 21273, 21274, 21275, 21278, 21279, 21280, 21281, 21282, 21283, 21284, 21285, 21287, 21288, 21289, 21290, 21297, 21298.